The organics bin gets cleared on a Friday morning so on Thursdays I try to clear up some of the older fruit & veges that are sitting in the fruit bowl or in the fridge. 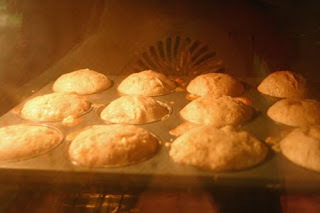 Today it was time to get rid of the brown bananas & what better way than in muffins. The boys will not eat brown bananas but if I make banana muffins with them, I can guarantee that they will be eaten.